$31 a day we thought....easy! We'll just have to be careful not to overload at the Whole Foods buffet and pass on happy hour with friends. Then we realized it was $31 for the entire week...that seemed like madness! With some research, planning and experimentation in the kitchen we figured out that, yes, it is completely possible to feed yourself on the budget...for one week. 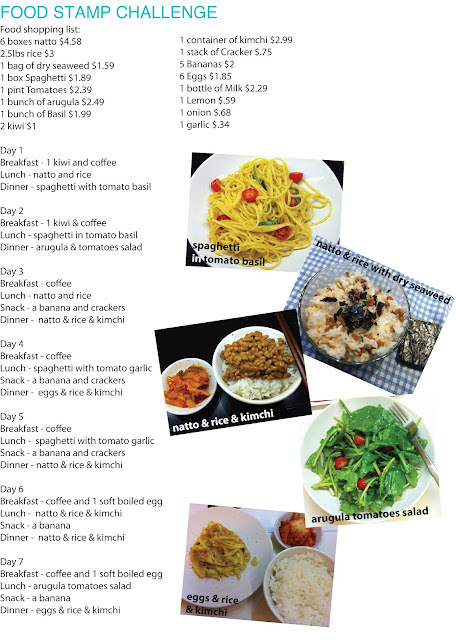 You can manage a reasonably healthy diet on the budget (see one Loomstate employee's menu below), but it's not sustainable. Our stomachs grumbled as we gazed in awe at the overflowing meals of friends and coworkers, and were so disappointed when we forgot to pre-pack our meals and were left without fuel for the day, but we knew there was a light at the end of the tunnel - this was only for a week. Could we do this for a few weeks, months? Not a chance. With a refreshed awareness of the difficulties of living on food stamps, we full-heartedly sent a message to Congress to protect food stamps for our fellow New Yorkers. We highly suggest that you take on the challenge as well! And learn more about other Food Bank for NY projects. See how Loomstate has partnered up with Food Bank for NY in the past.